Many of my childhood weekends were spent going on a car ride with my family around Miami, and I remember I would get so frustrated with my dad, because we would find really beautiful places, but we wouldn’t stop anywhere, we were just passing by. I had a different upbringing compared to most children. At the age of five, I emigrated with my mother and sister from Argentina to reunite with my dad, who had emigrated a few months earlier in hopes of preparing a new home for us in Miami, FL. My parents had given up on their home country after realizing that its corruption and lack of justice offered no opportunities to their two young daughters. Both college graduates, my parents realized they couldn’t do much with their degrees in Miami, so they founded their own packaging healthy food company, before healthy food was all the craze. When my sister and I weren’t in school, we would be at the warehouse helping my parents pack the finished goods in boxes and place them in pallets. Other times, my sister and I raced down the aisles lined with pallets, riding on pallet jacks or rolling chairs – we were kids after all. But now, as I look back I realize just how much my parents gave up for us. Still, each morning, they leave home at 6 am for work. Working in production, they spend the whole day carrying material that weighs over 50 lbs, in a Miami-heated warehouse with no air conditioning, just industrial fans. Unsurprisingly, both suffer from chronic back pain, and my mom has developed arthritis. Despite the harsh working conditions, my parents have kept on working with the hope that their young girls would have a better life in this new land full of opportunities. My parents, like most, had big dreams for me and my sister. As kids, my dad signed us up for every team sport he could think of– hoping we’d be good enough to receive a scholarship for college. My mom, on the other hand, enrolled us in the best education programs and mapped out our education from elementary to high school to ensure we’d receive academic scholarships. My mom made the better bet. We weren’t great athletes, but we excelled in school. We had to, as our mom constantly reminded us that our only job was to study and get scholarships, because we couldn’t afford a college education through our own means. We didn’t realize at the time just how impossible college would be for us, until I became a senior in high school. I always knew about our legal status, but education was my golden ticket out, or so I thought. As I began applying for my dream schools, my college advisor mentioned that I couldn’t access financial aid of any kind even though my grades and extracurricular were above the requirements. Then, I began receiving the acceptance letters without a financial aid package attached. Instead, it noted that I would be paying as an international student, and my acceptance was dependent on my ability to pay the tuition. I was devastated until I discovered Miami Dade Honors College, which offered to pay a third of my tuition and offered a list of private scholarships I could apply to cover the remainder of the costs. A year later, Florida would pass a law giving DACA students access to in-state tuition. The two years at Miami Dade College were fully covered by scholarships, and I began to hope again as I applied to transfer to a university, but despite all of this there were always reminders of our status. When my sister and I finally got our license through DACA, we began taking my parents to work to avoid “las redadas” – the raids – that threatened the unity of our family with deportation. The thousands of dollars my parents spent on legal assistance to fix our status would not be enough to disappear the threat of deportation. Feeling like you need to hide constantly, having a prayer to God as your only consolation until you’d get home, and see your parents at home with you took a toll. But, you learn not to take any moment with your family for granted. I began to believe that I was lucky to have had the two years at Miami Dade College, but now it was time to support my family by working. 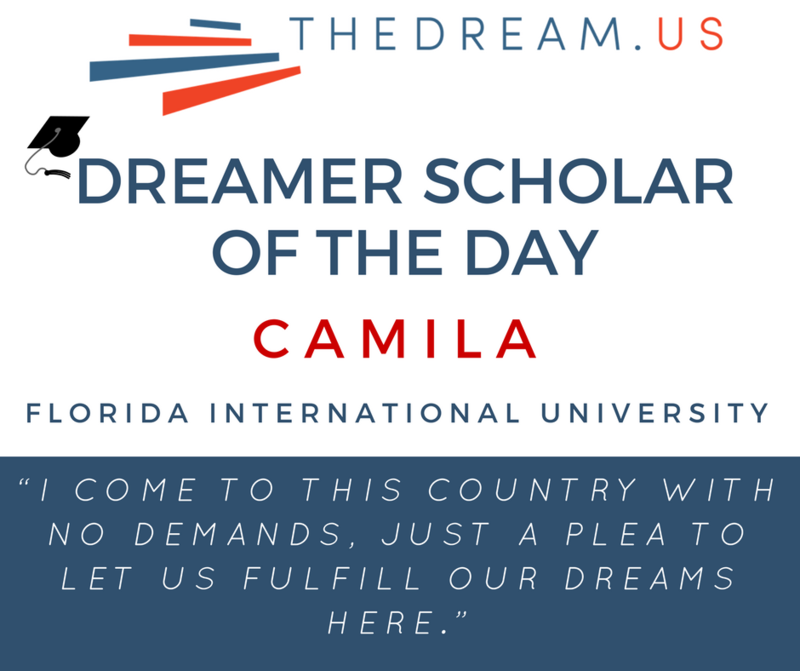 I believed that until TheDream.US scholarship who partnered with Florida International University to give highly motivated DACA student full scholarships. That meant didn’t have to sacrifice my education to support my family – I could study full time and work part-time. For those that question the need for immigration reform, I challenged them to simply go to a grocery store. Who harvests the food? Who delivers the food? Go to your company. Who are your customers? Who are building the infrastructure that facilitates your commute? If they determine that the immigrant community has no stake in facilitating their access to food and employment, then legislation to protect the undocumented community isn’t necessary. But, if they determine that we are essential to their daily living, they should call their representative in Congress and tell them to support a comprehensive immigration reform that won’t leave Dreamers orphaned. If a legislative solution isn’t passed, I will leave. America is the only home I know, but I refuse to offer my mind and money to a country that doesn’t want me, my family, or other hard-working and smart people. I refuse to continue gazing out the window as I pass by beautiful places without having a chance to stop and explore. I come to this country with no demands, just a plea to let us fulfill our dreams here.